TV and radio broadcaster Erwin Tulfo lashed out at Jim Paredes and dared him to a fist fight after the former member of APO Hiking Society cried foul over his previous statement against him. A few weeks ago, Tulfo gave a piece of advice to the family of Paredes, told them to protect the OPM artist because he might got struck by a car or stab by someone because of what he did to the Duterte youth during the EDSA anniversary rally. “Paliwanag niyo sa kanya [Jim Paredes] baka masaktan ka o masagasaan ka, mabundol ka o makalimutan mo ng umuwi o ang masakit pa baka masaksak ka sa ginagagawa mo,” Tulfo said. This statement angered Paredes and asked TV5 network for Erwin Tulfo's radio program suspension. Sponsor "This cretin threatened me on radio saying na mag-ingat daw ako kasi baka daw ako biglang masagasaan nalang, o masaksak, ma suntok, mabugbog, etc. He was full of malice and hate when he said it. It was almost like he was suggesting or inciting hate among his listeners to do it," Paredes wrote on his Facebook. 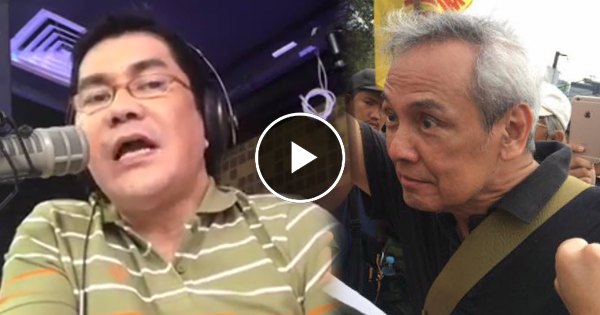 On Monday, Erwin Tulfo responded to Jim Paredes' appeal against him and he challenged him to come over to his radio station. “Jim Paredes pumunta ka nga dito sa istasyon, matatapos itong programa ko alas dyes ng umaga. Antayin mo ko dyan sa labas, lalabasan kita... Tignan ko yang tikas mo, yang mga tirada mong look at me look at me ako ang look at me-hin mo mamaya dyan sa labas ng gate. Susundutin ko yang mata mong hinayupak ka,” he said. Tulfo even said that for the first time in his life, he would disrespect and show no mercy to an old man like Jim Paredes.